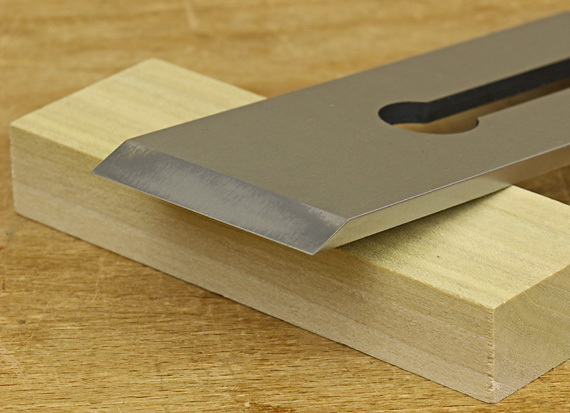 A new steel developed at the Japanese Institute of Engineering and Metallurgy holds tremendous practical promise for all who use sharp blades, including busy woodworkers. Though not yet ready as a marketable product, it appears to have the potential to be a complete game changer. Here’s the details. The key feature of this steel is its ability to, in effect, self sharpen. By combining sophisticated powdered metal technology with several unconventional alloying elements, the researchers have been able to produce a unique grain structure in the steel. Whereas a sharp edge in any conventional steel wears by “dropout” of iron, alloy, and carbide grains, which leaves behind a degraded surface and edge, the newly developed steel product wears in an entirely different manner. The grain structure in the outer few microns of this steel gets compressed just before it wears. When metal wears away, it does so in minute thin “flakes,” leaving behind a surface – and a cutting edge – that is as polished and keen as it was before the wearing process started. In fact, once properly sharpened, the edge actually becomes slightly sharper as it wears in this unique manner. It is as if the wood that is being cut by the blade’s edge acts as a very slow sharpening “stone”. There is a limit to how long this process can persist simply because the volume of steel near the edge is gradually depleted. The details can be found in the latest issue of the Institute’s bimonthly journal but a full English translation is not available at this time. A brief introduction is reproduced below, with permission. The development group estimates that the new steel product will be available to tool makers by the end of this year. After a bit more tweaking, it is expected to have very favorable working characteristics for blade formation. I will keep readers posted with new information on this wonderful innovation that really has the potential to change the way we all work in our woodshops. Sano-san has informed me of a single drawback to the new steel. It will only be produced on a single calendar day each year, namely today, which is named in honor of all those who believe that high quality woodworking is easy, quick, and every step is a sure thing every time. I can’t wait to see a comparison with PM-V11. So if I read correctly, today is not a production day and we will have to wait until next year? Thanks for breaking this story. Ahhhh . . . . . I used Google Translate for the Japanese – interesting. I believe that you have to wait until April 1st 2016 to see the comparison with PM-V11, but I can guarantee since now that the results will be “almost” unbelievable!!!! Just wait until the marketing department gets a hold of this. Perhaps a quick (first) name change was in order to protect his identity, as well as his relocation to Honolulu following his induction into witness protection. Rumor has it that “Dr. Sano” first cultivated the idea during his days as a dentist serving the black market dentistry community in downtown Tokyo. He was supposedly flown to Honolulu under new cover to protect him against the accusations and threats levied against him by the rival steelmakers in Sheffield. How he let himself get posted on Yelp I have no idea, and I hope that anyone reading this comment section will not blame me for exposing his dubious cover. The (most) important question is … will the new type of steel be available in assorted colors ? A nice Yellow steel would be wonderful as it would match all of my DeWalt equipment ! Haha, I’m glad you guys enjoyed the nonsense. Thanks for reading. And just for the record, the post is entirely made up, as the Japanese portion clearly indicates! Any resemblance of the proper nouns to reality is entirely coincidental. Well this had me going. Honestly as someone who only discovered and started practising “fine” woodworking seriously a year or two ago, and is finally pretty proud of my sharpening skills…. I was livid! after all the hours I put in honing my technique (I’ll show myself out for that one) now sharp edges would be available to all!? It was with a nervous chuckle and a sigh of relief that I finished the article. Thanks, Owen. Glad you enjoyed it. I think it’s easy to take the bait on this one because we all wish we could eliminate or at least greatly reduce the time we spend on sharpening. I think that’s how some sharpening gadgets and systems sell so well. I’ve been “sold” more times than I’d care to admit. In the broader picture, there are the fantasies that woodworking can be quick and easy if you just buy this/do this/etc. Even Dr. Insano can’t do that.